The Conduct of War is the study of the way in which political and economical changes since the French Revolution have altered both the techniques and the aims of war, and its theme is that war which is not fought in pursuance of a clear feasible policy will always end in disaster. Fuller begins by examining the limited wars that were possible in the age of absolute rulers, and the destructive impact of revolutionary and democratic government on this state of affairs. Not only did the new armies of the Napoleonic age grow immensely in size and military power the aims for which war was fought began to change. It was no longer a question of forcing the enemy government to alter its policy in specific ways the purpose of war became the destruction of that government and the absolute surrender of its people. Such a concept of war, Fuller contends, is a disastrous return to barbarism. Each war leads inevitably to a state of instability which will persist and worsen until a new conflict breaks out. Fuller was an ardent admirer of Clausewitz's On War, and in his book, he develops Clausewitz's theories of limited war to show their applicability to the history of modern warfare. 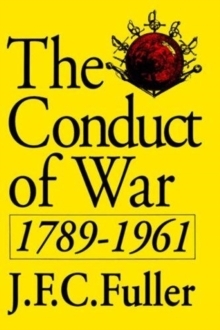 Although some of Fuller's more extreme political views are now discredited, The Conduct of War remains one of the seminal works of 20th-century military theory.